Seager Hill has a reputation for being a difficult hill, both from the access viewpoint and from the position of its summit. The former seems ad hoc, as the hill is situated on a private estate and instances when hill walkers have been told to leave as there is no access to the hill have been recorded, although many others visit without any such problem, whilst the latter is due to the hill having two summits both of which are similar in height with the one believed to be the higher also having a summit that is relatively flat. These two summits are given a 269m spot height on contemporary Ordnance Survey 1:25,000 Explorer maps. However, they are now separated in listing terms as the more north-westerly is given a 272m summit height based on an 892ft (271.9m) levelled height on old Ordnance Survey 1:10,560 and 1:2,500 maps, whilst the more south-easterly summit is given a 270m summit height based on an 886ft (270.1m) levelled height on the series of Ordnance Survey Six-Inch maps. However, each summit has obstruction from woodland to their immediate south-west, and although I wanted to visit and survey each, I did not know whether I would succeed, this being dependent upon no estate workers being on the hill, and also upon satellite coverage and the performance of the Trimble. 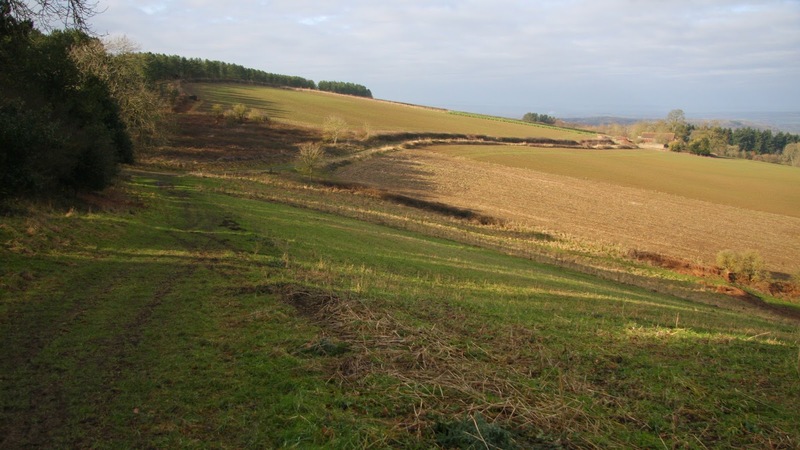 Having surveyed Grendon Green / The Firs (SO 599 573) and Hegdon Hill (SO 585 539) earlier in the morning, I drove south toward the small hamlet of Trumpet and turned on to the A 438 road and then south on minor lanes leading toward Seager Hill. I parked close to a small quarry before the road crests the south-eastern ridge and descends to the small community of Woolhope Cockshoot, as I gathered all necessary equipment and grabbed my rucksack I heard shooting from what I thought to be the high wood close to the summit of each hill, this didn’t fill me with much hope for the task at hand, but as long as I was quiet and apologetic if meeting any estate workers I thought I may get away with my clandestine visit. 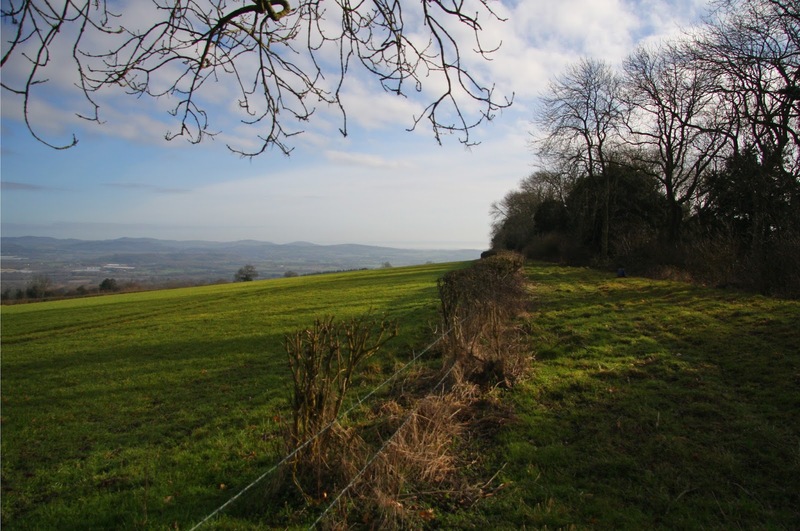 An advantage with approaching the hills from this direction is that a track marked as a bridleway leads toward a large barn, from which a public footpath heads over a grazing field to the hill ridge, from where it’s only a short walk to the south-easterly summit. 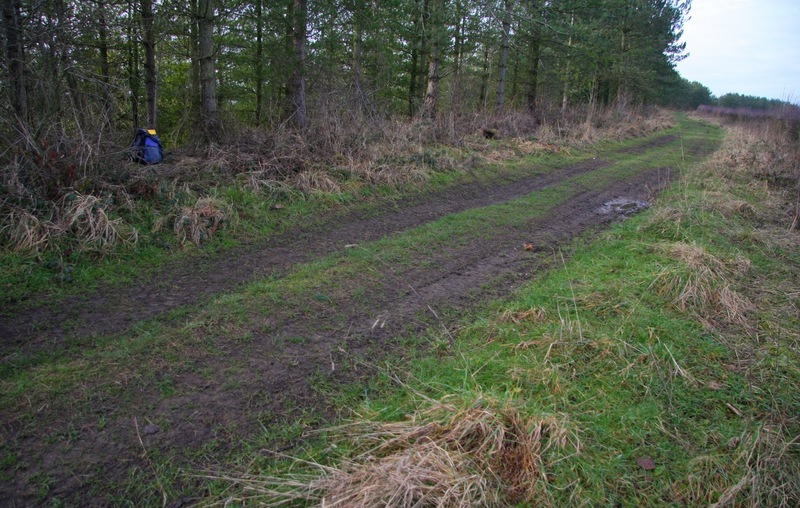 All seemed quiet as I set off up the track, thankfully the shooting had stopped for now, and I made good progress. 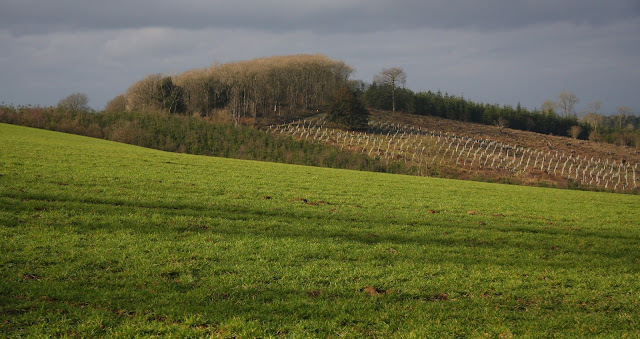 Once on the ridge I turned left and followed a green track between the wooded steep southerly slopes and a hedge with the pastured green grazing fields to the north. 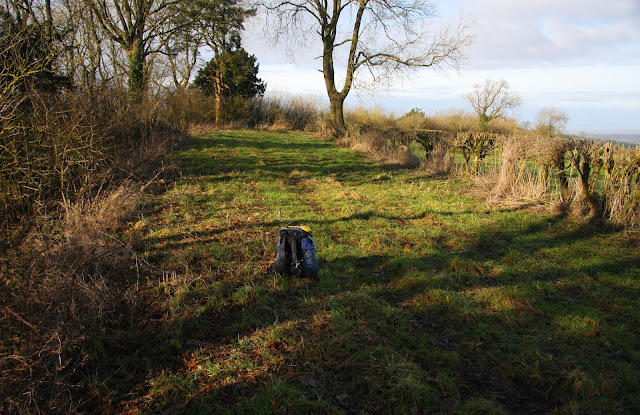 The summit area for the south-easterly hill is relatively flat for 20-30 metres or so, with its highest point positioned close to, but thankfully not in the wooded area to the south. I spent a number of minutes assessing the lay of land and moved the set-up position about 5 metres further north-west as I thought this ground a teense bit higher. 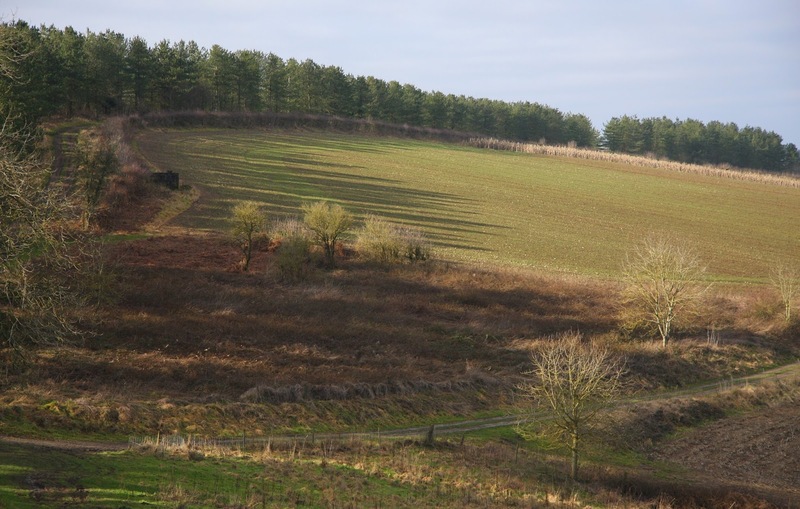 As the Trimble slowly crept down to its 0.1m accuracy level before data should be logged I stood and waited, took a few photos and listened out as another two gun shots echoed across the land. Once the accuracy level was attained I pressed ‘Log’ and waited for the allotted five minutes of data to be gathered. Having packed the Trimble away I was now on a there and back route heading north-west firstly on the green track and then on a forest track, before leaving the former a walker headed up from the forest track, I asked if he was out for a walk or was he also bagging hills, out on a walk he replied explaining that he was following the ridge, I asked if he had encountered any estate workers or pheasant shooters and he said no, this put me at ease and when I reached the forest track more gunshots echoed out across the land but from further south, which meant that as long as the Trimble could pick up satellite reception on what is recognised as the higher of the two summits, I should get away with my clandestine visit. 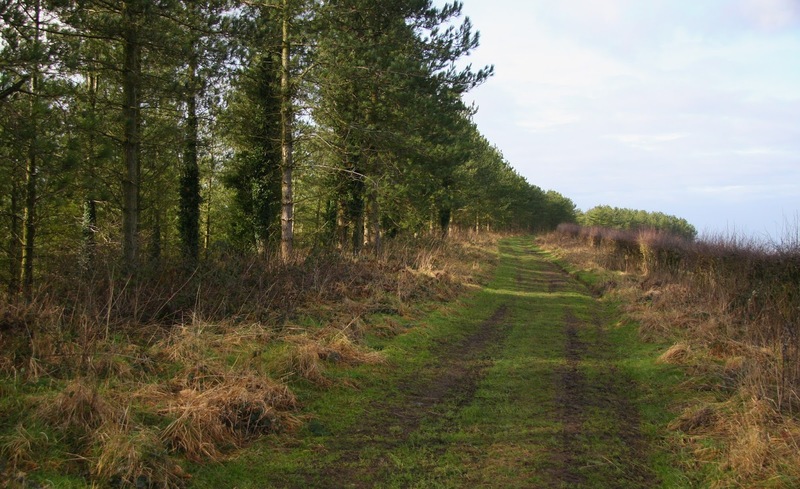 One large felled tree had stopped any vehicle access on the continuation of the forest track as it slowly gained height; this was easily bi-passed for a walker on its north-easterly side. 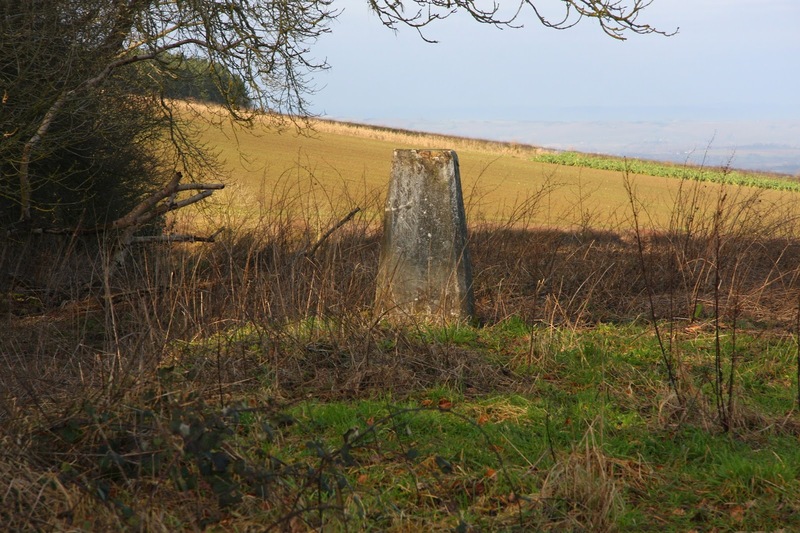 The track led to a locked gate where a fence gave access to open hillside leading to the 264m map heighted trig pillar atop what is named as Bunker’s Hill on Ordnance Survey maps. From here a muddied path led down to the connecting col with Seager Hill with a green vehicle track then leading up to the area of its summit with mature woodland on the left and a mature hedge on the right. After reaching what seemed to be the high point I spent a number of minutes walking back and forth assessing the lay of land, the high point was definitely just in the wooded area, which was unfortunate for what I wanted to do, this was about 3 metres from the south-westerly edge of the green vehicle track, however the land also looked relatively flat for quite some distance close to the green vehicle track as it continued in a north-western direction. 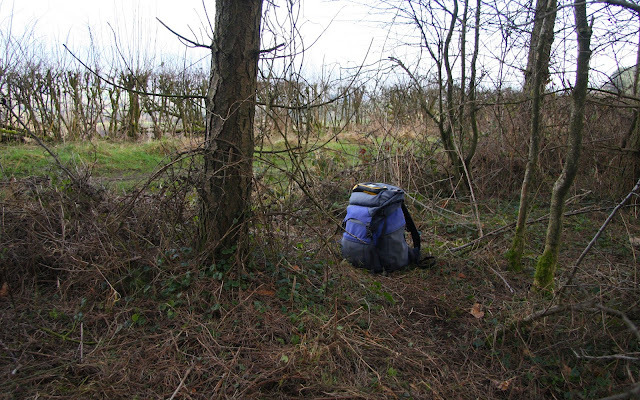 I stomped around in the wooded area looking for what I thought was the high point, choosing my spot I assembled the Trimble on top of my rucksack, measured the offset between its internal antenna and the ground below and then started the long wait for the 0.1m accuracy level to be attained. I knew I was in for a long wait as the Trimble was placed next to a conifer tree with another close by, and with a mature hedge across the other side of the green vehicle track, I thought I may be there waiting for at least 40 minutes, and even then the accuracy level may never be attained. I waited and waited, occasionally scampering back to the Trimble to have a quick look at the accuracy level as it slowly ebbed down to 0.1m. In instances like this I usually check the Trimble every five minutes, but realising this would probably be a very long wait I checked the accuracy every ten minutes. During this wait I walked further down the green vehicle track looking back as I did, eye sight alone is not ideal for judging such things as height differences, but after surveying more than 400 P30s with the Trimble one gets attuned to such things, but still an optical implement is always favourable, however I judged that the Trimble set-up position was the best that eyesight alone could achieve. After 20 minutes of waiting I scampered back to the Trimble expecting to see that it had crept down from 0.26m to about 0.18m accuracy, but there on the screen was the magical 0.1m, I pressed ‘Log’ as quickly as I could and stepped away and stood behind a tree with a large smile on my face. As I stood smiling away thinking how impressive the bit of kit that the Trimble is I thought I’d better collect ten, instead of the customary five minutes of data, this would give 600 individual data points instead of the customary 300 for the equipment to process, and the more the better as the position of the Trimble wedged on the periphery of a large conifer plantation was not ideal. 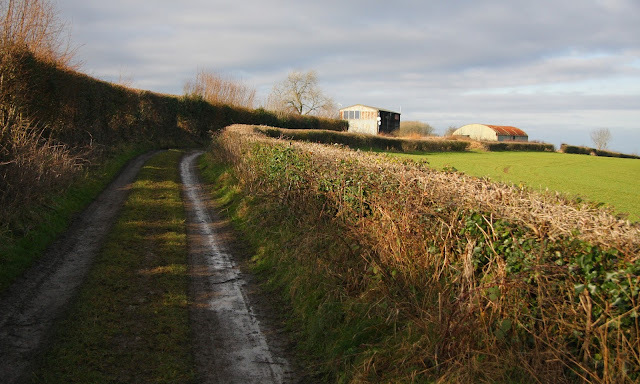 Once ten minutes of data were gathered and stored I closed the Trimble down, packed it away and retraced my inward route back to where the public footpath crested the ridge, and then followed it down to the bridleway on the track beside the large barn, which brought me back to my awaiting car.